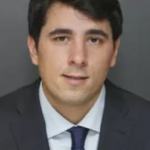 Nicolás Bonilla is a Spanish tax lawyer of Arola law firm and customs agency. He studied law at the University of Autónoma in Madrid, and has training in tax law, trade, customs and compliance. He has a degree in Management in Information Technology from the University of Anhembi Morumbi in São Paulo, and holds an MBA in Business Administration and Management from the University of Camilo José Cela, Madrid. He is member of the Excise Duties Department in Arola, Madrid office. The department is responsible for advising, legal defense (administrative and litigation) and management of excise duties. Furthermore, it offers legal support in relation to customs law.